Claude Willett Thompson was born in Durham, England in 1888. He died in Daytona Beach, Florida February 20, 1973. He received B.A. and M.A. degrees from Oxford University. He moved to Canada in 1911. He fought in World War I. On returning to Canada, he entered the teaching profession at the Old High School for Boys in Quebec City. In 1923 he transferred to the High School of Quebec as senior master in the boys' section. In 1932, he moved to Ottawa and became housemaster at Ashbury College. Claude W. Thompson came to Sir George Williams College in 1933, and during a 25-year career on the full-time staff taught English literature and humanities, first as instructor in English and history, and after 1934 as professor of English. He was appointed senior professor of humanities in 1937. 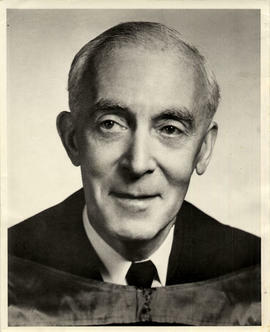 He was appointed assistant dean in 1952. He was the first chair of the English Department. After his retirement he continued to teach part-time for several years. Among other books, he wrote Humanism in Action, published in 1950. He played a major role in developing the Canadiana Collection of the Sir George Williams Library. Claude Willett Thompson gave 14 medals that had belonged to his brother Lieut. C.J.McK. Thompson to the Sir George Williams University Library. The library transferred these medals to the Concordia University Archives in 1990. The fonds provides information from Thompson's writing projects on the history of Scouting, and on humanism, as well as his participation in World War I. The fonds consists of memorabilia of Claude W. Thompson's and his brother's participation in World War I. It includes correspondence, press clippings, and a copy of a paper he wrote on Canadian author and historian William Wood (1864-1947). There is also a review of William Wood's book The Fight for Canada, and a copy of the book.